Wyoming is one of those states where there is simply not enough information to build an accurate picture of barn owl populations. The Wyoming Breeding Bird Atlas shows most observations of barn owls and confirmed nest sites in the eastern third of the state, however, the southwest corner also has its share of barn owls sightings and there are isolated records in other areas. Most breeding records are from Goshen County in the southeastern corner. They have also been observed breeding in cliff crevices in neighboring Platte County. But sightings and confirmed breeding sites recorded by state biologists are low in number and scattered. The large amounts of hay, wheat, and barley grown in the state, as well as large stretches of grasslands, would provide good numbers of potential prey, but one aspect of the wide open topography is a noted lack of potential nesting sites—cliffs and trees are scarce, and ranches and farms are expansive, with few outbuildings. And regardless of good habitat, the state receives high amounts of snow fall, which in the worst years, set barn owl populations back considerably. Idaho, where barn owls are common, runs directly into western Utah. However, barn owl progress into the rest of the state from there is impeded by high mountains. The Wyoming Breeding Bird Atlas states that “their breeding range is likely much greater than currently known” and this seems a reasonable assumption. The atlas suggests that areas such as the Snake River Valley, Star Valley, and the Bear River floodplain in Lincoln county along the western border with Idaho have good habitat and may support numbers of barn owls. More investigation may lead to the recording of larger numbers of owls that previously expected. 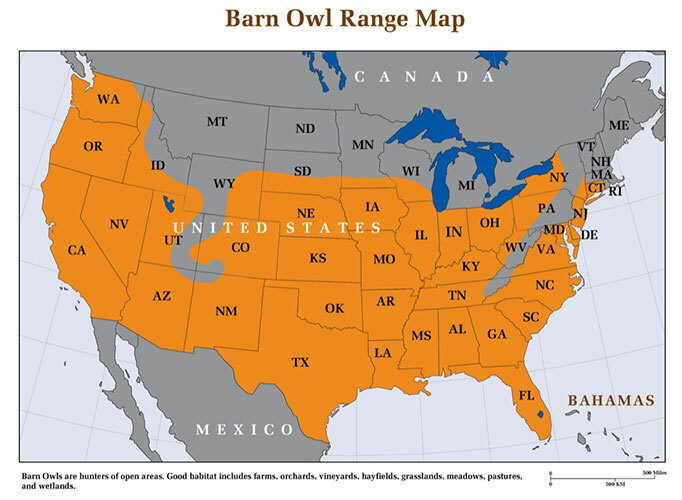 The range map reflects the strong probability that Idaho populations of barn owls continue along the Snake River Basin into far western Wyoming and breed there in some numbers. Thanks to Wyoming biologist Susan Patla for contributing first hand information for this article. State biologists report that barn owls are doing well overall in the state, with good populations in the southern panhandle where escarpments and cliffs provide numerous nesting sites, in the North Platte Valley, and in the southwestern and south central portions where many grasslands are still intact. The eastern half of the state supports fewer barn owls due to the intensive farming of soy and corn which provide very poor habitat. This is a fairly recent change—over the past ten years, a great deal of prairie has been turned into high intensity farming of these row crops. Although researchers have not conducted in-depth studies of barn owl populations in the state, the frequency that wildlife rehabilitators take in injured and orphaned owls shows that the barn owl is doing well in Nebraska. From shortly after the clearing of the forests by the first pioneers till the 1960’s, barn owls were common in the myriad small farms that dotted the countryside from east to west. Barns, sheds, abandoned buildings, and large dead trees provided nesting sites; and hedge rows, fallow fields, pasture, hay, and corn cribs provided habitat for high numbers of rodents. Nearly every barn in the state had its resident barn owls. Since those days, Pennsylvania has undergone the same regional decline in barn owls as many other northern states. The causes are many, but include changes from small farms to larger enterprises that farm more intensively, the replacement of wooden barns by metal ones that do not allow access, and the switch from pasture and hay to corn and soy. 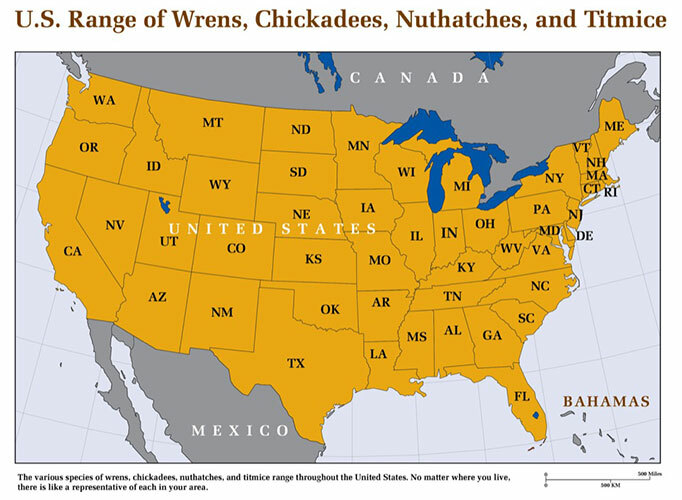 Today, populations are doing well in the south-central and northeastern-central sections–state biologists recently indicated they had located 178 confirmed nests, but there are many counties for which there are no observed nest sites (some of these, in the north-central region, are heavily forested and are unsuitable for barn owls.) See map below. Nonetheless, Pennsylvania still has a great deal of excellent habitat, many counties where hay is the dominant crop, and plenty of old wooden outbuildings still standing. The state’s CREP program has been establishing natural grassland in many areas, which is the barn owl’s prime habitat, and barn owl populations in neighboring Ohio have been increasing due to an intensive nest box program there. So, barn owls may very well increase in the state over time and nest boxes installed near good habitat (pasture, grasslands, wetlands, orchards, and fields) are recommended. The conclusion reached by researchers that barn owls are continuing to decline was based on comparison of the 1984-89 and 2004-08 Breeding Bird Atlas surveys. In the 1984-89 survey, barn owls were discovered in 251 survey blocks. This dropped to 117 blocks in 2004-08. More recently, the Pennsylvania Game Commission had been recording an average of 11 active nests annually in Montour, Columbia, and Northumberland Counties; these decreased to six in 2014 and five in 2015. Such figures would easily lead to the conclusion that a steady decline was occurring. However, the high number of severe snowstorms that swept across the region in the years between the two surveys needs to be considered. No less than nine heavy blizzards struck the northeast in those intervening years, six of them striking Pennsylvania. Each of these six storms dropped ten to forty inches of snow on the state. The Superstorm of 1993 blanketed Pennsylvania with 24 to 40 inches of snow in one day. Such heavy snowfall that lasts for many days in sub-freezing conditions undoubtedly comes close to wiping out entire state barn owl populations. Populations in surrounding states were equally devastated. These snowstorms occurred in rapid succession: 1993, 1996, 2003, 2004, 2005, and 2007. After each storm, the decimated barn owl population had to rely on fresh immigrants from other states to rebound, but the almost yearly blizzards were recurring setbacks to populations of a bird that is not adapted to survive in conditions of deep snow. So, the numbers in the two surveys may only show a short term reduction, and not be indicative of a long term, continuing trend. In other words, barn owl populations are naturally dynamic and current trends may not be indicative of the long term health of a population. The Game Commission has increased its research, confirming active nests and monitoring successful fledging. Over 1000 young owls have been banded so that any owls recovered later might yield clues about their movements and longevity. If you know of any barn owls in your area, are interested in installing nest boxes, contact wildlife biologist Richard Fritsky at 570-879-2575 or rfritsky@pa.gov. Barn owls were once very common in much of Oklahoma which harbored huge areas of natural grasslands. They are still particularly abundant in the panhandle of the northwest dominated by short grass prairie, and the southwest with its mix of mesquite grassland and mixed-grass plains. The northeast, west-central, and southern regions have good to fair populations in tallgrass prairie broken up by stretches of oak forest. However, these grasslands have recently begun to be overgrazed by cattle and planted with row crops, reducing barn owl numbers. Barn owls are rare or absent in the far eastern part of the state where oak-hickory forests and oak-pine forests dominate. With almost three million acres of hay, and over five million head of cattle, Oklahoma provides expansive additional habitat for barn owls in the form of cultivation and pasture as long as overgrazing does not occur. The eastern third of the state is riddled with rivers and large bodies of water, and wetlands are widespread in the southeast and east central parts of the state. points out that the barn owl was once the most abundant raptor in north-central Oklahoma, but that is no longer true. Since rodents have remained abundant, the issue appears to be lack of nesting sites, a common problem in grasslands. Combine this with the continuing loss of old buildings for nesting, the switch from wooden to metal barns, and the cutting down of dead trees, the barn owl in Oklahoma appears poised to benefit from nest box programs. The University of Central Oklahoma analyzed 47,000 Barn Owl that revealed Oklahoma barn owls feed primarily on the Hispid Cotton Rat, followed by Deer Mice, and Ord’s Kangaroo Rat. It will breed in cisterns, church steeples, self-dug burrows in river banks, cliffs, caves, tree cavities and of course barn lofts and other outbuildings. Thanks to biologists Doug Wood and Steven Sheffield for their contributions to the information on barn owls in Oklahoma. Utah is one of those states where extensive research has been conducted on barn owls. Researchers Dwight Smith and Carl Marti conducted a number of studies in the state. It was Smith who famously discovered a colony of barn owls in the buildings of an abandoned steel mill near Overton in 1968. Eventually this colony numbered 38 individuals before the mill was torn down. This was one of the first records of a dense breeding colony in the United States. the Great Basin desert in the western side of the state where they are likely rare. They are particularly common in the agricultural valleys. Smith and Marti found two excellent barn owl populations, a northern population that stretched from Utah County to Box Elder County and a southern population in Iron and Washington counties. Tony Wright, former Utah biologist who worked in southeastern Utah states that the barn owl is also common there. He reports that they are often hit by automobiles in that area due to their low flight pattern while hunting. Old buildings, decayed cottonwoods, and self-dug burrows in the sides of arroyos are the most common nesting sites. The most common prey items found through pellet analyses are the meadow vole and mountain vole, followed by house mice, deer mice, and vagrant shrews. Courtship runs from mid-January through March 1968. Eggs are laid as early as February but as late as April. The first hatchings occur in early March and the first fledglings leave the nests in mid-May. Fall nesting also occurs, though not as commonly. Usually incubation begins in early September with fledglings appearing in early December. The agriculture of Utah plays an important role in sustaining healthy barn owls populations. Wheat, barley, and oats, poultry, and cattle are raised in almost every county. New Jersey barn owls have experienced the most recent downturn of any population in the United States. Unlike so many eastern states where barn owls declined dramatically by the 1960’s, as late as the 1990’s barn owls were being found in very good numbers in the farmlands of New Jersey. Naturalist Leonard Soucy Jr. conducted a fifteen year study there, finding barn owl nests under bridges, in bell towers, warehouses, chimneys, and barns, with many nests in urban areas, and concluded that the New Jersey barn owl population was one of the most abundant populations in the nation. Since then the barn owl has declined precipitously inland where much of New Jersey’s farmland with cattle and hay has been converted to housing tracts, lawns, shopping malls, and roads with a devastating effect on barn owl numbers. Today, barn owls are very rare there where they once thrived. The bright spot in the New Jersey barn owl population is the excellent and stable habitat provided by the wetlands along the Delaware River in the southern portion of the state. Here, for over 30 years, researchers Bruce Colvin and Paul Hegdal of the Barn Owl Research Foundation have been installing and maintaining nest boxes in prime habitat and chronicling the year to year fluctuations in barn owl numbers and breeding success. Their work shows that barn owl numbers rise and fall annually according to a number of factors, not the least of which are the severity of the previous winter and the availability of small mammal prey. information on barn owl population dynamics. In 2015, out of 39 nest boxes near marshes along the Delaware River, 16 nest boxes fledged young. That year, 65 chicks were banded, and to give an idea as to how the population’s breeding output fluctuates, the number of chicks banded between 2009 and 2014 ranged between a low of 68 in 2013 to a high of 155 in 2009. The recognition of natural swings in barn owl populations is significant: often, researchers will conclude that barn owl populations are declining when instead they are merely seeing short term fluctuations. In addition to the populations along the marshes, there is some evidence that barn owls are breeding in some numbers in abandoned buildings near the coast in northeastern New Jersey but little monitoring of this population has been done. In summary, even though barn owls may continue to be present throughout the state in scattered and low numbers, most of the breeding population is concentrated along the southern coast in Salem and Cumberland counties. This population continues to be stable, in large part due to nest box installation and maintenance. Prey consumption studies show that the meadow vole comprises a large percentage of the diet in New Jersey. A few fall nests have been observed but it should be noted that such nests suffer higher failure than those nesting attempts made in the spring. One important finding from the Colvin/Hegdal study was that they have found a fairly high number of previous year fledglings breeding in their natal area. Out of 22 adults captured in 2015, 6 (27%) had been banded in the study area in previous years. This shows that local populations, at least on the east coast, can recruit future breeding birds from their own fledglings. l distribution in New Mexico is defined by altitude—the mountains exclude barn owls– but excellent populations exist in the eastern third with over one million acres of farmland, the southwestern corner with lots of agriculture, and a central corridor of farmland formed by the mid-central Arizona New Mexico Plateau, extending from southern Sandoval County southward. San Juan County in the far northwestern corner also provides prime habitat where the southernmost portion of the Colorado Plateau extends into the state. Crops grown are melons, pecans, grapes, wheat, tomatoes, and other vegetables. The farmlands of New Mexico are excellent areas for the installation of nest boxes for the purpose of using barn owls as contributors to integrated pest management programs. Prey includes troublesome voles and pocket gophers, as well as shrews and deer mice. Perhaps the best concentrations exist on the High Plains that cover the eastern third of the state. Researchers have discovered a heavy dependency of barn owls on nesting in abandoned buildings, evidence that manmade structures may be bolstering populations, and also suggesting that as these buildings disappear, the barn owl may decline. However barn owls also nest under railroad bridges, in culverts, cisterns, and often dig their own burrows in the soft banks of arroyos. Biologist Denver Holt of the Owl Research Institute in Charlo, Montana reports that the first record of nesting in the state was in 1992, a surprisingly recent occurrence. Recently a number of nests have been discovered in the Mission Valley at an elevation of 3000 feet, where fertile soils, pasture, cattle, crops, and a national wildlife refuge contribute to good habitat. Here they nest in natural holes and juniper root systems in the clay cliffs. then scattered in the rest of the state. It may be that other good populations in other parts of the state remain to be discovered, especially in agricultural areas at lower elevations. Although some authorities have cautiously called the barn owl a “rare visitor” to the state, it is clear that the barn owl breeds in the state, with successful breeding pairs in years without heavy snowfalls, and populations nearly wiped out during the worst winters, only to recolonize in subsequent seasons. The large amounts of pasture, hay, and grasslands provide very adequate hunting, but the northern latitude tends to regulate numbers by severe winters. Undoubtedly the occurrences are scattered, and low in number in most areas. Yet the bird has been recorded year round.